The drifting as formula drift is amazing but the vendor stands and the car shows at the event bring some amazing builds. Here are some of the best we saw at the event. First up we have this rear mount turbo set up Porsche Cayman. This car was quite a change of pace compared to many other cars at the event. AEM definitely made an impact with a car of this caliber. The most interesting part of this car was that it was center drive. Very intersting. Another detail pointing to the extreme extent this car has been taken to, carbon wheels. Up next a Mazda RX3 properly outfitted at the Nexen tire Booth. Keeping true to the Mazda Roots, this RX3 featured a 3 rotor. Such a small engine bay compared to cars of this day. With a race car comes a rice car interior, you can’t go wrong with a wood-grain steering wheel on a car like this. Of course, you can’t leave Ryan Tuerck’s Ferrari 458 Powered Toyota GT86. This car is a feat of engineering fitting a DOHC 90 degree V8 into a chasis such as this is no easy task. I can only imagine how fun this car is to drive. Within the car show, there was this sweet FD rx7. Bumper missing and all, but at a drift even this is what you want to see. A more refined fd rx7 was this one also in the car show. 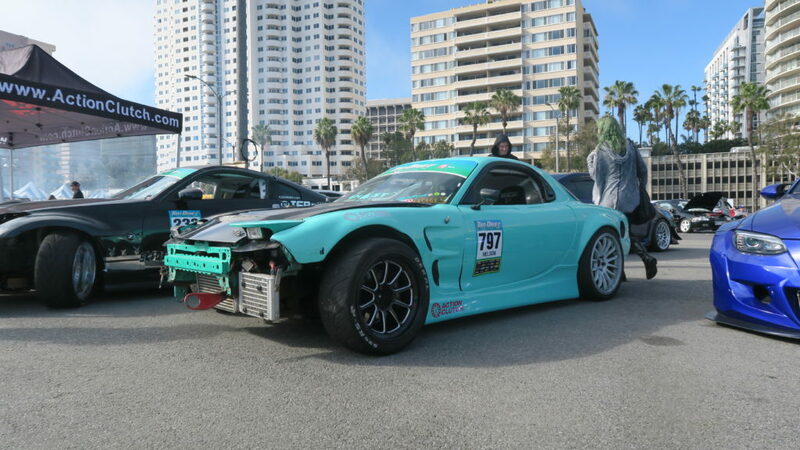 There was a full spectrum of cars here at Formula Drift Long Beach 2018. The attention to detail on this s2000’s engine bay was stunning. Complete with a gold alternator. This AE86 atop a truck was an interesting JDM setup. Drifter Starter Pack. A really wide s13 coupe caught my attention. A nice Ferrari 458 and BMW M3 also made an appearance. This event brought some amazing cars that were enjoyable to look at. For more Formula Drift coverage check out my article actually covering the driving!